SKU: KC02. Categories: E.T., KYZ, Nova, Various Small Decals (All). Tags: 1982, 1983, 1984, 1985, 4130, Champion, Chromemoly, E.T., Kuwahara, KYZ, Nova. 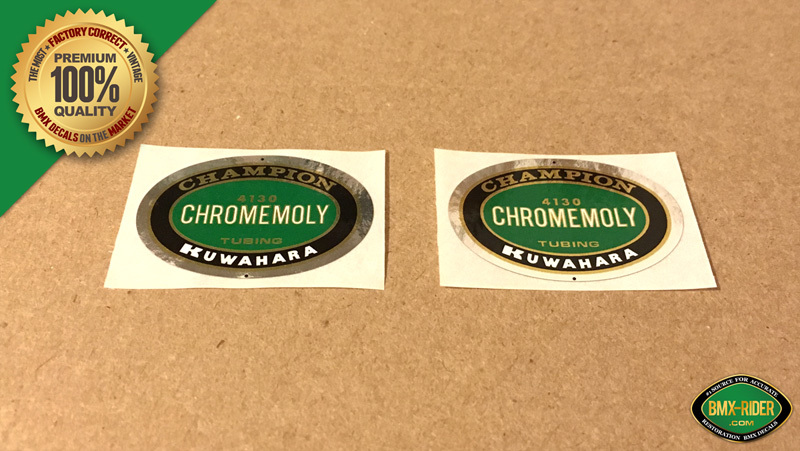 This is a NEW very RARE FACTORY CORRECT Kuwahara “CHAMPION” 4130 CHROME-MOLY Decal Sticker for your seat post tube and fork of your vintage old school BMX. These were found on 1982 E.T forks, 1983 -1985 Nova, 1982 – 1983 KYZ as well as Kuwahara and Kuwahara / Apollo Mountain Bikes (MTB), Mixte, Cruisers, and Road Bikes. 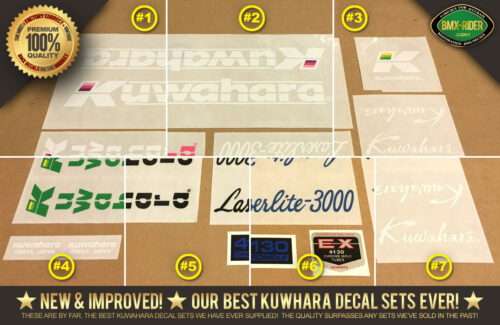 Probably the rarest of Kuwahara decals you will ever find. Very Accurate & Precise Details. Almost identical to original factory specs. Includes the 2 little ‘placement dots’ just like the original factory decals. Offset printed just like the original factory decals – NOT silkscreened or Digitally Printed. Die Cut on silver foil decal stock. These decals have been offset printed and are of the highest standards of print. These decals are Factory Correct and have been printed on Silver foil stock exactly like factory originals. 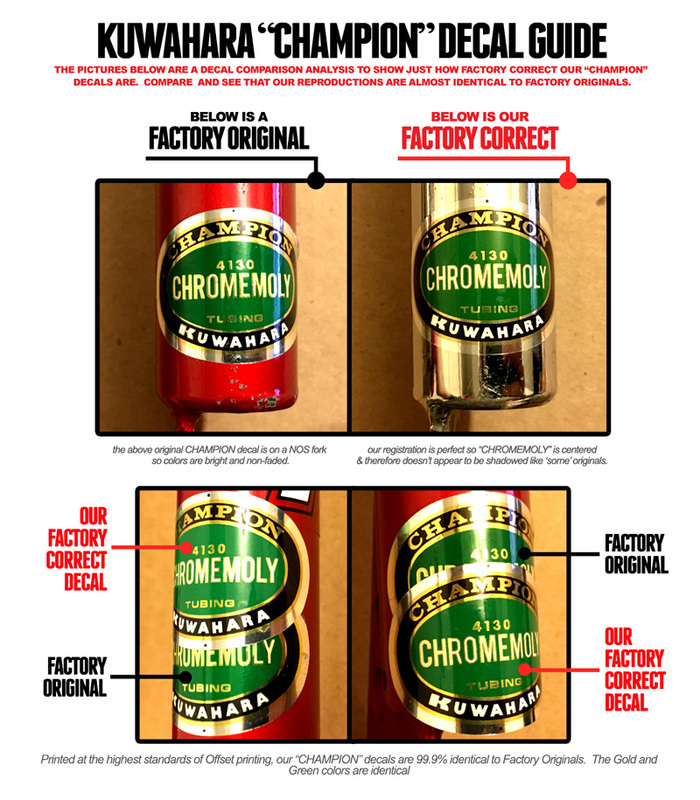 Place these next to un-faded originals and you will not be able to tell the difference!Please Note: With original sets, the registration was off at times, so the white text “CHROMEMOLY” would be off to the left or right at some original decals and would look like a shadow. Our registration is perfectly in the middle just like a perfect original. 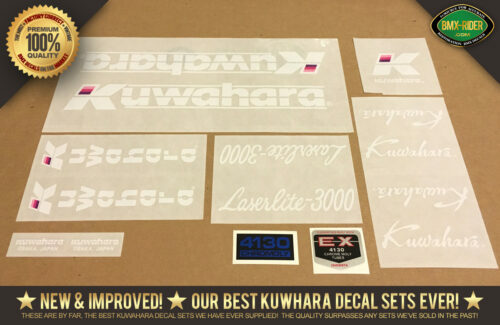 These decals were used on certain Kuwahara BMX’s like the E.T., KYZ and Nova. On E.T’s, they were only used on the forks ONLY as the forks were 100% chrome-moly. These were also found on vintage Kuwahara & Kuwahara Apollo Mountain Bikes (MTB), Mixte’s, Cruisers, and Road Bikes.